We’re coming down to the finish, finally! 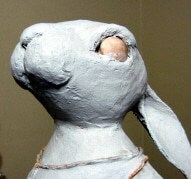 I spent at least 5 hours adding paper mache clay and the shop towel mache to the upper portion of the bunny, and now she’s just waiting for her final bronze coat. I may try tinting the bronze in a few places, like the casting of the original Degas sculpture that I’m loosely plagiarizing. I haven’t totally decided yet, though. If you haven’t seen the other videos in this series, you can find them all here, on YouTube. By the way, we had a small oops yesterday – Jessie mistakenly sent emails to my list instead of to her own subscribers. The Aweber email system isn’t as easy to figure out as it should be, but we’ll work on it. I hope nobody minded. And, now that my house is almost put back together again, it’s time for me to start on my next big project. Since I need a new best-selling book (or video?) to help pay myself back for all the trim and flooring I just bought, I’m hoping I can get some feedback from you. I have two things in mind, and I’m not sure which one I should do first. The first idea is a book with patterns and instructions for making the bunny, cat and puppy dolls that I sold at art fairs years ago. 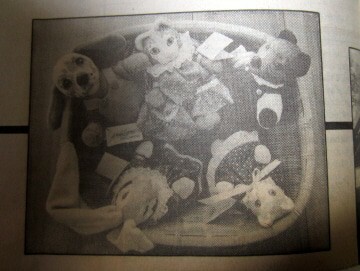 They were so popular, my parents started helping me with them — the photo is from a big article about my dad and the dolls that appeared in the Bellingham Herald.Â (Sorry about the quality of the photo – I haven’t got my scanner hooked up yet. )Â People really did love them, and they aren’t terribly difficult to make. The bodies and ears are soft cotton velour, and the heads are painted paper mache. The other idea would be a bit more challenging, especially considering my primitive videography skills and the size of the project. I also think it might appeal to fewer people, but I’m not sure. It would be a full-length DVD, complete with printable patterns, for a life-sized paper mache baby giraffe. It’s the kind of thing that would be really special in the corner of a nursery or in a pediatrician’s office (and I’ve wanted one for my own living room, for years…) Amazon would probably make me charge about 20 bucks for it. Any votes? Ideas? Anything I haven’t thought of yet, but you think I should work on, instead? I love getting feedback, so please chime in. When you did your bunny slippers on you ballerina did you use the paper towels I didn’t see what you used. Thanks for all the help you do.